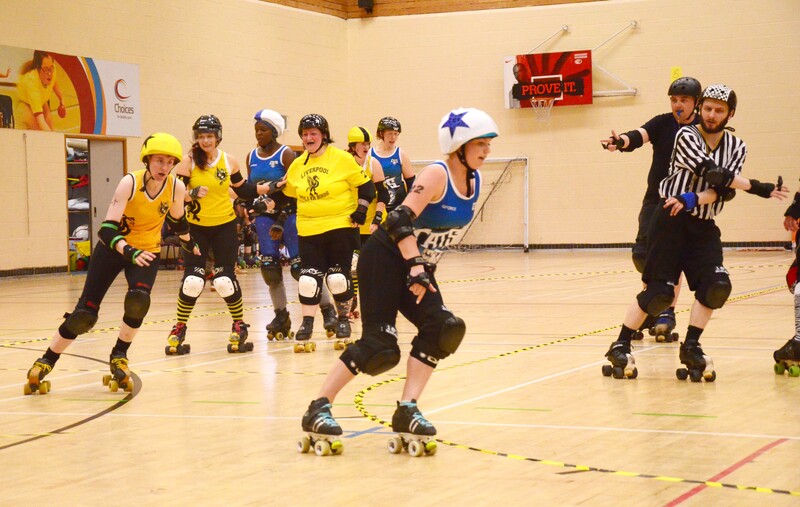 The Cats travelled to Liverpool to face our old pals, Liverpool Roller Birds’ B team on Saturday. The first away game of the season, the Cats knew it was going to be tough. But they weren’t quite prepared for the Birds’ nippy jamming and eye-watering blocking. 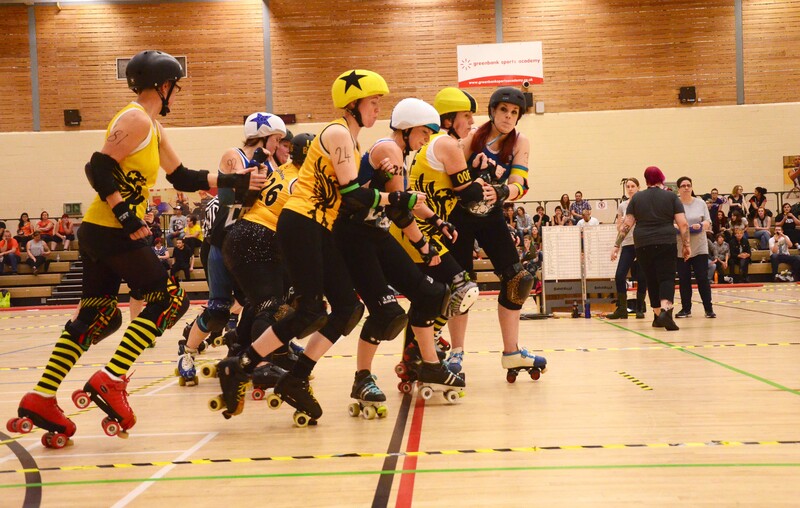 Liverpool got off to a great start, securing lead jammer in the first jam and scoring 7 unmatched points. Wakey’s Lysette ‘Glory’ Bell scored 4 on the second jam, but the team failed to capitalise early on, with a powerjam in Liverpool’s favour enabling them to take a 41-point lead just eight minutes in. Wakey’s impressive blocking evidenced in home bouts earlier this year was not so frequent, but standing out early in the first half were captain Kirsty ‘Fu’ Quinn, Chrissie ‘Bat Hit Crazy’ Webster, Katie ‘Honey Monsta’ Clayton and Anne ‘Acid Pain’ Body, who made strong walls and tough work for Liverpool’s jammers. But Liverpool’s offensive tactics were hard to match, and despite a good effort from Wakey’s Diana ‘Dee Tsar Star’ Bracewell in picking up five points, with 12 minutes left in the first half LRB had taken their lead to 94 points to Wakey’s 9. Wakey’s Janine ‘Bash’ Hubbard took the jammer star next and scored 5 points, quickly followed by more points from Katie ‘Lookin’ Fur Trouble’ Swift. But Liverpool hit the 100 point mark with 11 minutes to go in the first period. The tide seemed to be turning when a powerjam in Wakey’s favour saw Vicki ‘Wheelie Coyote’ Gray pick up 12 points, followed by two point scoring jams for Bell. A change in tactic towards the end of the first half saw the Cats line up on the pivot line, giving the jammers a run up start as opposed to the more popular scrim-start. But it failed to pay off, with Liverpool taking lead jammer and a powerjam as Gray was sent to the box. By halftime LRB had wracked up 175 to 40, not an unchaseable lead, and the Cats came out fighting after the break, with Bell and Vicky Gray both taking early points in the second half. However, a powerjam in Liverpool’s favour meant they were soon past the 200-point mark with 22 minutes left on the clock. Impressive blocking for Danielle Millea, Zoe ‘Bruise Buffer’ Melia and Lindsay ‘Linda LuMardy’ Pantry saw that the damage was not as bad as it could have been, and a turn in fortune had Liverpool’s jammer sent to the box shortly after, with Bell able to claw back ten unmatched points for Wakey. With 15 minutes left, Wakey blockers Webster and Clayton did a good job containing another Liverpool power jam as the scores crept to 233 to 68. Gray was able to claw back four more points before the Liverpool jammer committed a cutting penalty, setting up a power jam in Wakefield’s favour. Swift took the star in the next jam, taking the Wakey tally to 82 to Liverpool’s 254 with ten minutes on the clock. A win now out of reach, the determined Cats did not stop fighting, with Gray picking up more points while captain Quinn made easy work of the Liverpool jammer, preventing more points. A late error saw Wakey’s Hubbard sent to the penalty box, with the Cats showing great walling skill at containing Liverpool’s jammer, who took their score to 297 to 91 with three minutes to spare. Despite a final push by Hubbard, the last jam ended with the score to 307 to LRB to 92 to WWC. Even though it was a big loss for the Cats, it was great to be back on track against some of our oldest derby sisters. The game saw the return of Hubbard after the ‘nine month injury’ and it was fantastic to have her back. 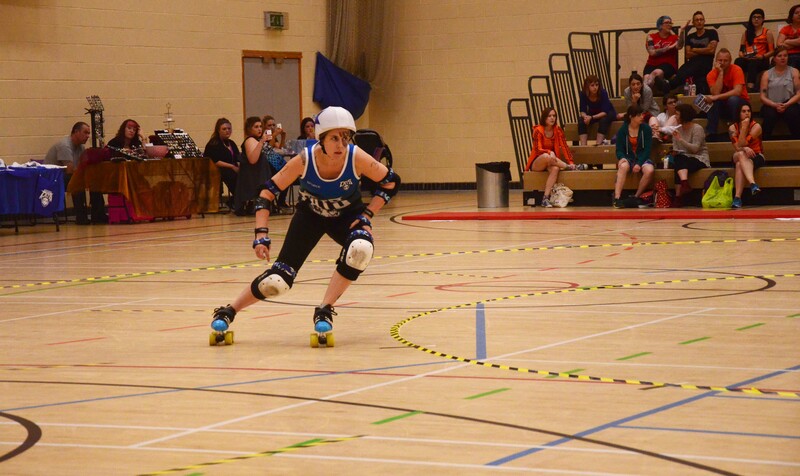 It was also our first game without crowd favourite (and huge point scorer) Jenny ‘Joanna Bruisin’ Richardson, who has moved to Newcastle Roller Girls. Lots to work but also lots to celebrate for the Cats. A big thank you must go to line up and bench Caroline ‘Florence Night in Jail’ Pegg and Lucy ‘Luce Lightnin’ Rellins, who stepped in for our usual bench team, and of course Hayley ‘Right Hook’ Brooke for bringing us live Twitter action throughout the game.